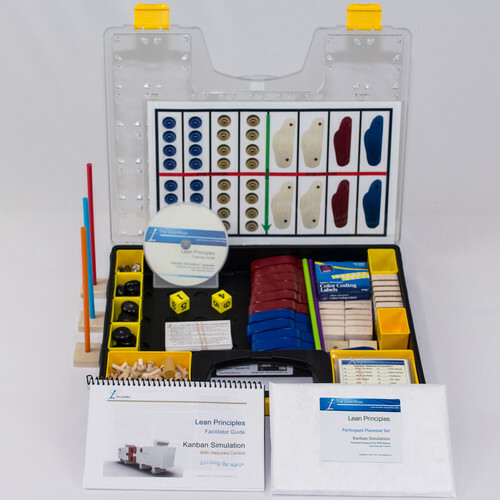 The Companion Car Kit contains a Basic Car Kit for the Car Factory hands-on LEAN simulation plus PowerPoint files for the 2-step and 4-step simulation exercise to get you started. 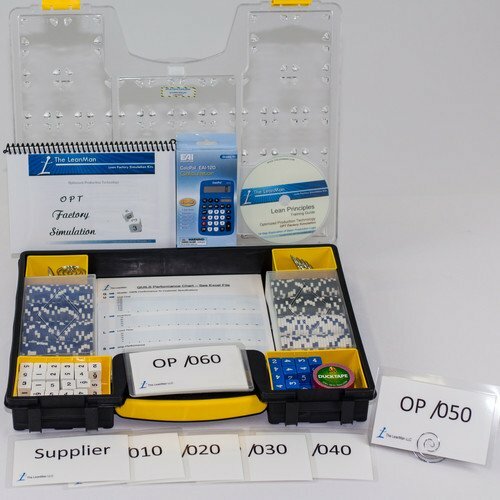 The package includes a Companion USB drive with all of the PowerPoint files for each simulation event; a set of 5.5 x 8.5 laminated participant placemats for the Learning to See the Waste 2-step executive simulation event; a wet-erase marker for metrics; and a large-digit easy to read stopwatch to time the events. 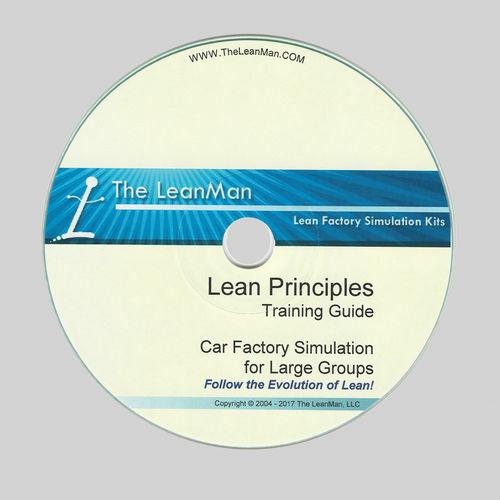 The Companion Lean Factory Simulation Car Kit builds upon the Basic Car Kit by providing some easy to facilitate Lean Principles training exercises and support material files. The Companion is recommended as an additional kit for those who have purchased the Deluxe Kit and wish to add capacity to the simulation sessions or train multiple teams for a little competitive fun. 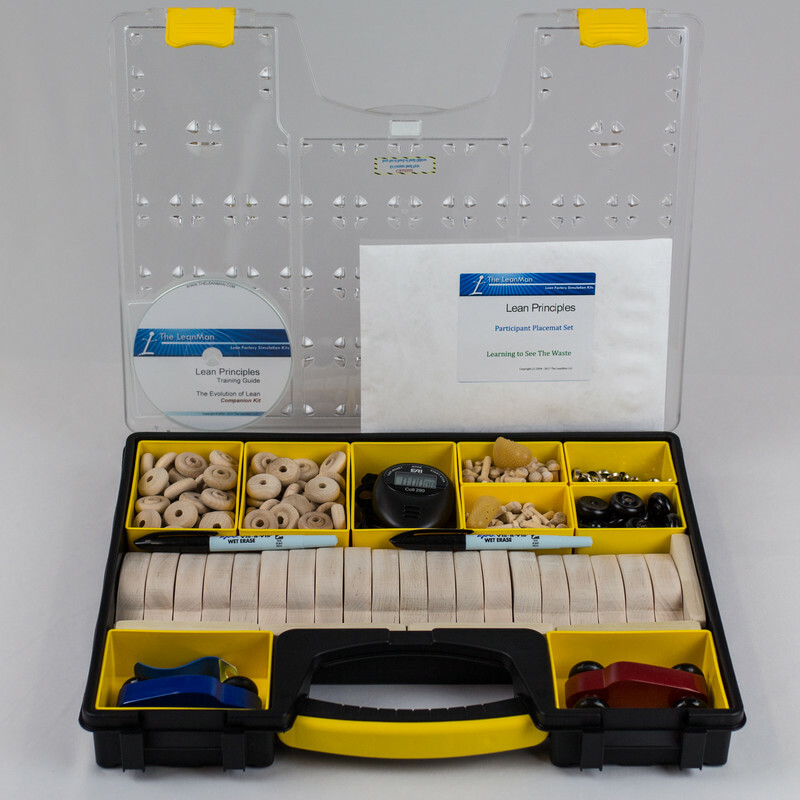 Each kit comes with the files for the training setup guide, plus instructions for the standard 4-step flow simulation. The first event, MRP Batch ‘n Queue, shows the effects of moving large batches of product through several stages. The second event, adding Continuous Flow push, shows the effects of overproduction which simply means producing more sooner or faster than the next stage requires. The third event, adding a kanban pull signal to Continuous Flow, begins to coordinate each team member, controls inventory better, and shows where some obvious balance opportunities exist. The fourth event, adding local control with point-of-use inventory and built in quality, shows the advantage of becoming lean. The kit includes a set of 8.5 x 5.5 laminated participant placemats for the Executive Level two-event simulation Learning to See the Waste. This short but powerful simulation is a perfect first time event to showcase the power of lean mfg. It packs a real W O W factor for first time lean participants. This executive level 2-Step simulation is the simplest event to run but packs a big WOW factor. It requires just one Car Factory Kit per team. Plus, with the laminated participant instruction placemats, it's so easy to perform that single person can easily facilitate five or more teams, making it great for large audiences and conventions. This 4-step simulation uses one Car Factory Kit per team, and a single facilitator can easily run 2 or 3 teams in parallel for a little competition and metrics comparison. This simulation event is also provided as an editable set of files on the USB drive that allow customization to the facilitator's specific target training needs. Purchased as a separate supporting product (it is included in the Grand Package), this simulation is used with multiple Car Factory Kits to expand the event size to accommodate larger groups for an introductory Lean experience. 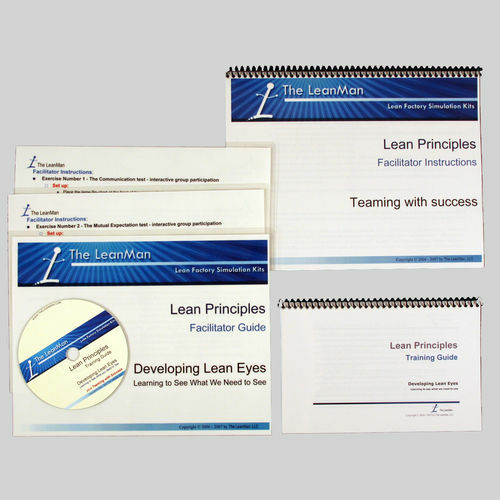 The 4-step simulation is designed as an introduction to Lean for variable sized groups of participants in the four main flow methods. Purchased as a seperate supporting product, this 3 step simulation exercise will explore the service side of the car factory, so instead of assembling new cars, we repair them. Value Stream Management concepts are used to improve flow door-to-door in this unique and fun exercise. 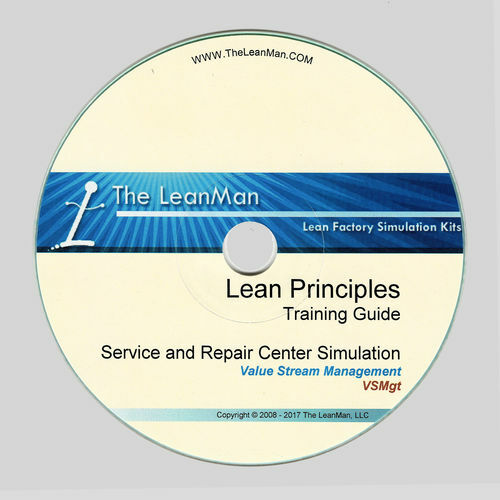 This simulation requires purchase of at least one of the LeanMan Car Factory Kits or Deluxe Packages. 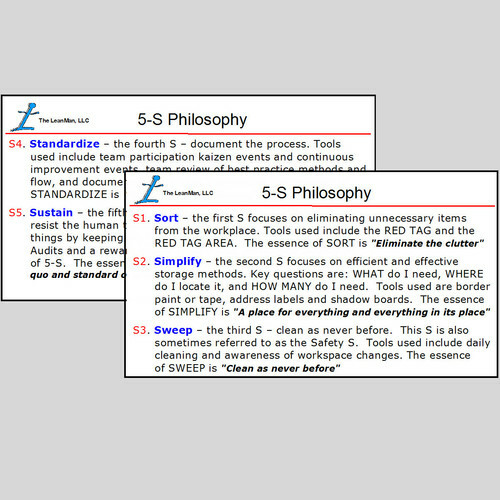 Keep the team engaged with 5-S Philosophy Wallet Cards as a handy reminder of the essence of 5-S.
Large Group Simulation Package used to expand the Car Factory Simulation event for up to 39 participants. Learning to See The Waste Participant Placemat Set. 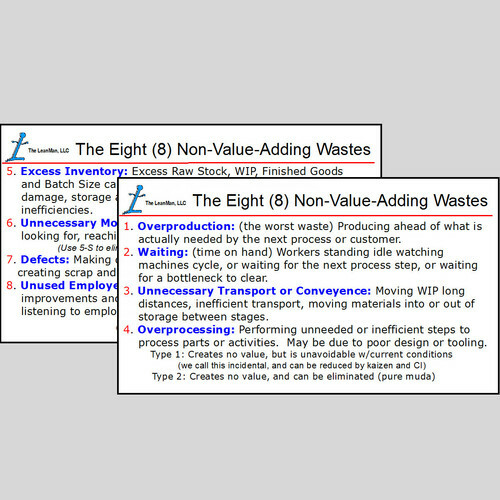 The OPT Factory Simulation Game explores the variables that influence production outcomes. Based upon the training game developed by Eliyahu Goldratt while developing the lean synchronous manufacturing system at General Motors. 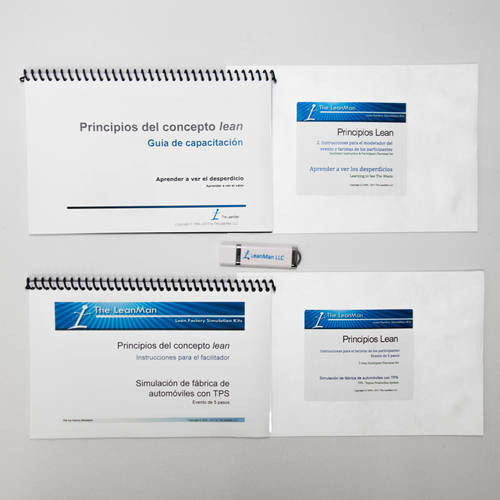 Spanish Upgrade Package - Deluxe provides all the presentation software and printed simulation materials that are included in the standard Deluxe Car Factory Kit Package. 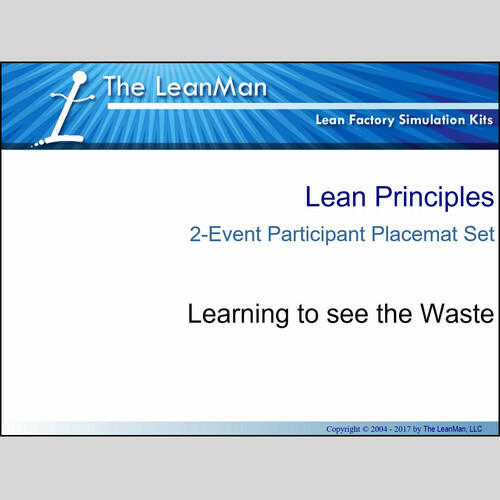 Value Stream Management concepts are explored with this fun alternative simulation designed to be used with the LeanMan Car Factory Kit.